Where the inner child rules. My first language is Japanese. My second and mostly spoken language is English. Now I am trying to learn French. My mom is a lady of many talent and skills; fluently speaking French is one and unfortunately I just never tried to learn French from her. However, I like French. It sounds nice and I would like to be able to speak a little bit and understand French a bit more when I go to France or French speaking country. I kind of want to be able to say that I watch French film; without subtitles. The only thing stopping me was my self so I researched a class, found it, paid for it and now Count and I have been going for three weeks now. It’s refreshing to use a part of a brain that wasn’t used for while and being in a class room to learn something new. Now, I’m off to my class now! 15 Jun	This entry was published on June 15, 2015 at 5:11 pm. 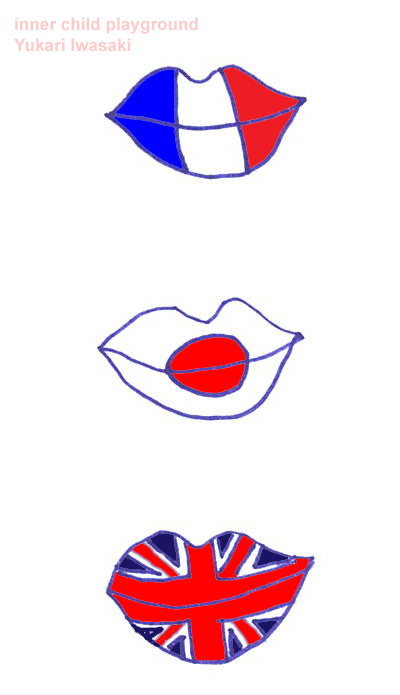 It’s filed under Design - Graphic Arts, Drawing and tagged challenge, design, english, french, french flag, graphic art, illustration, japanese, japanese flag, learning, learning french, learning new language, mother tongue, new challenge, second language, union jack. Bookmark the permalink. Follow any comments here with the RSS feed for this post.